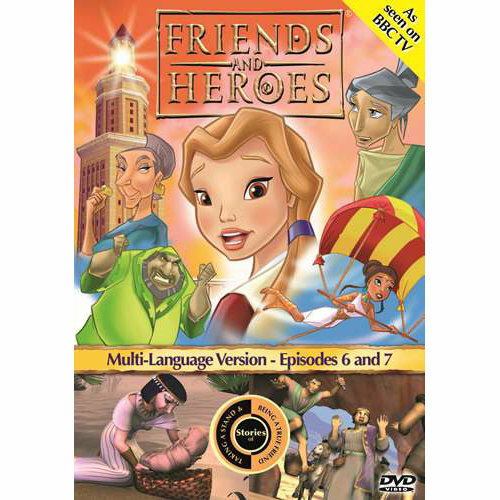 Friends and Heroes is a UK produced animated adventure series for children featuring amazing 3D Bible Stories. Friends and Heroes is the tale of two young people - Macky and Portia - whose idealism and friendship leads them across the ancient world, from the fabled Egyptian port of Alexandria, to the besieged city of Jerusalem and finally, to the very heart of the Empire: Rome. As they fight for justice and even survival against the might of the Roman Empire, they become friends and then, in turn, heroes. Like our heroes, children will be empowered by what they see and hear, as they share the courage and compassion, the everyday dangers faced by Macky and his friends. Ideal for Sunday/Sabbath School leaders and parents, Friends and Heroes provides highly effective tools to enjgage today's media-savvy kids, especially boys, adding excitement, entertainment, and solid Biblical teaching to Christian education programs!